Arkansas Country Doctor Museum > Ruth Q. Eldred, R.N. three years helping on the farm and caring for her younger siblings. Her aging grandfather became ill and while caring for him she made the decision to enter nursing. In 1925 she enrolled in Fayetteville City Hospital School of Nursing. More mature than other students in her class, as most entered immediately after high school, she often was referred to as “Mother” by the younger students. Ruth was an excellent student. One article states that Dr. Forrest Ellis, a prominent physician at Fayetteville City Hospital offered to send her to medical school, an offer she did not accept. She graduated in 1928 and was licensed in Arkansas as a registered nurse (license # 1675). Her ﬁrst job was in Eureka Springs, Arkansas. In 1930 Dr. Charles Holt from the Holt-Krock Clinic in Ft. Smith recruited her to work in his clinic. In 1934 she went to Sparks Hospital where she remained until she retired in 1969. A retirement reception in her honor for her 35 years of service was attended by about 130 hospital employees, doctors and administrators. Her tenure at Sparks included a variety of administrative and responsible positions, particularly during and immediately following the WWII years. In 1945 she became simultaneously Director of the Sparks School of Nursing, Director of Nursing and Manager of Medical Records. She continued to teach a dosage and solutions course (later called pharmacology) after she left her administrative responsibility in the nursing school to work as a nurse anesthetist. The Director of the School of Nursing who followed her said Miss Eldred continued to help students on their rotation through the operating room and remained a loyal supporter of the school. Ruth remained loyal to her Sulphur Springs roots and her family. On many of her days off she returned home to help on the farm. Ruth was also known for her handwork of crocheting, knitting and was an excellent cook. Through her encouragement one of her younger sisters, Katherine Pearl also graduated from Fayetteville City Hospital School of Nursing. 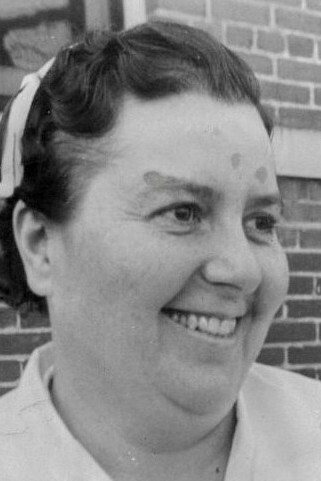 A niece, Evelyn Eldred, entered and excelled in nursing through Ruth’s inﬂuence. Ruth Eldred died on November 7, 1983 at the age of 80. She is buried at the Grand Army of The Republic (GAR) Cemetery in Sulphur Springs, Arkansas. After her death on what would have been her 100th birthday year, 2003, a Memorial Fund in her honor was established through Sparks Foundation.